Having returned from my 2019 winter trip to Yellowstone about a week ago, I’m still visualizing the beautiful snow-covered landscapes I was recently privileged to pass through. And for a present-day Californian (but raised in Montana), it was a particular delight to watch it snow. I realize that now, in my mid eighties, it is unlikely that I’ll go again in winter. As it happened, we were in the middle of the government shut-down, but, thanks to the concessionaire Xanterra, which covered the cost of grooming the roads as well as furnishing their usual pleasant rooms and good meals, we had no trouble getting around. For potential visitors a little or a lot younger, I would still highly recommend that you go! The friends who joined me were able to handle the snowy trails around Upper Geyser Basin and Fountain Paint Pots. This was my fifth trip there in winter. Incidentally, I’ve been asked how many times I’ve been to Yellowstone altogether, and it must be in the dozens of times by now. You need to leave your car in Mammoth. That’s where you cease to encounter plowed roads, since the park has a policy of simply grooming the other snowy roads, making them suitable only for snowcoaches, snowmobiles, and a few cross-country skiers. If you don’t know what a snowcoach is, take a look at this picture from 2012. Rather than the triangular tracks we used to ride on, the coaches now have very large, low pressure tires. The ride is quite smooth. Phone numbers for Xanterra are (866) 439-7375 and (307) 344-7311. 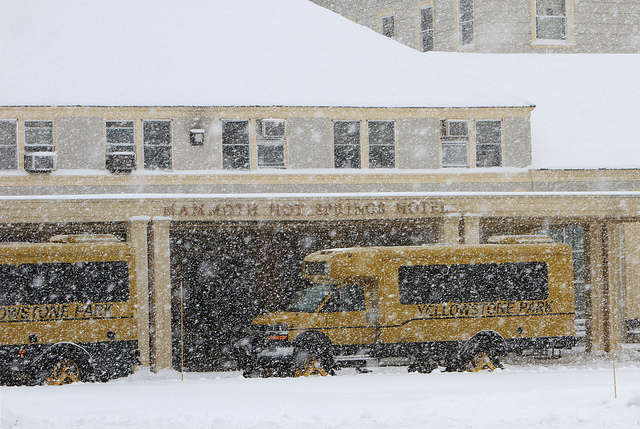 You would have to be extra lucky to find available rooms between now and winter closure, this year on March 3rd, but think about planning way ahead for next winter. Keep in mind that you can’t see all the park in winter—except maybe on skis. The groomed roads are limited to Mammoth to Old Faithful, Norris to Canyon, and West Yellowstone to Norris. They do try to keep the road from Mammoth out the Northeast Entrance to Cooke City plowed. Here is the link to the map showing what roads are plowed, groomed, and closed: https://www.nps.gov/yell/planyourvisit/parkroads.htm. I can’t resist crowing a bit: the snowcoach drivers and other Xanterra personnel were quick to let me know that they use and treasure my guidebook, Yellowstone Treasures, now in its fifth edition. In fact, when I sat behind the driver in one coach, he admitted to being a little nervous that he might get something wrong in his commentary. (He was superbly capable.) At the end of our trip, but before I left the snowcoach, he asked a colleague to pass the bound copy of the book (the one that Xanterra drivers share and use regularly), through the driver’s window for me to sign. I had never before seen a copy with a library-type binding! Photo credit: Jim Peaco, National Park Service, December 12, 2012. Planning for a Winter Trip to Yellowstone? Comments Off on Planning for a Winter Trip to Yellowstone? With things beginning to shut down and weather growing more wintry in the park, maybe it’s time to think about a trip there. It can be glorious to see everything covered in ice and snow, icicles glittering from the tree branches, frozen waterfalls, and everything cushioned with quiet. In my post last October 24th, I quoted a snippet of winter description to whet your appetite for such a Yellowstone winter trip. From the same author, I’ve chosen some longer excerpts, the most eloquent descriptions of the Yellowstone winter scene I’ve ever read. T. Elwood (“Billy”) Hofer was guide to tourists, scientists, and hunters and an all-round capable outdoorsman. He was one of the first people to traverse the world’s first national park on cross-country skis (which he called snowshoes). He was there in the fierce winter of 1887. Next year you’ll be able to read the whole amazing story in my historical anthology, Through Early Yellowstone: Adventuring by Bicycle, Covered Wagon, Foot, Horseback, and Skis, to be available by early summer to coincide with the National Park Service centennial. With twenty-first century climate warming, you may not see quite what he saw—but maybe you will. On February 16 I visited Norris Geyser Basin. A heavy fog hung over the country, with a light snow. As I approached the Basin, I was startled by the resemblances to men and animals the ice-laden trees showed, as, standing sentinel duty on each side of the road, they appeared to be watching our approach. Everything was loaded down with the steam frozen as it had drifted from the geysers. There were fantastic forms of men and women looking into the pools. Up the road were seen hogs, rabbits, mules, elephants, leopards, tigers, cats and dogs; animals of all kinds and shapes, creatures that outside of the Park nothing but a disordered mind could conjure up. All were in white, but often with dark eyes, ears and mouth, or limbs or faces, where the deep green of the pines showed through the white ice. Now and then a bough free from frost projected through the ice to form the plume of a soldier or the ears of a mule or rabbit. Again there appeared the form of a woman holding a child, bending over it as if to protect it from the wintry blasts. . . .
Wandering around among the pools in the mystery of the fog, alone in the world—like one at sea on a raft without a sail in sight—I could not see the ghostly goblin band over the hill I had left behind, but I could feel their presence; and now and again I would suddenly come in sight of more of them as I approached the timber either on my right or left. I found ice and snow everywhere in the valley. 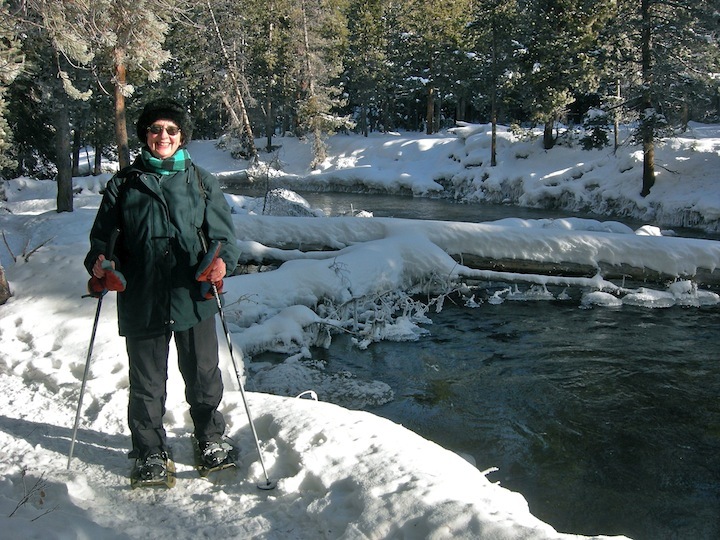 I could travel on my snowshoes on snow and ice 8 ft. deep, by the side of streams of hot water, while snow was falling on me, and white rabbits were mysteriously disappearing from sight among the snow-laden trees on my left. Flies were seen on the surface of the stream, and where the water was collected in shallow pools a water insect like a worm could be seen on the bottom moving sluggishly about. Most of the colors of the rainbow lined the bottom of the stream, though the shades were pale. I followed down the stream of the waters running from Constant, Black Growler, Ink Geyser, and the pools in the northern part of the Basin, until it was joined by the waters from the Monarch, New Crater, Vixen, Spiteful, Coral and the other beautiful pools, springs and geysers in the main basin. . . .
As I approached Coral Spring I was almost tempted to shoot at a large polar bear; he was ten feet up a dead tree near the spring; he had climbed up the tree and was looking back at the hot water as if afraid of it; I could have believed him to be alive as I first saw him through the fog and falling snow. He was only ice, however, and had grown right there where he was, as the frozen steam had added to his bulk. He was at least ten feet long; and as he grasped the tree with all his legs, one foreleg thrown over a dead limb, he was a perfect picture of a great white bear. If carved from a block of ice by an artist he could not have looked more natural. . . .
Further east I came to another steam escape, somewhat sheltered from the wind. Near this was an ice-covered tree, which had taken the form of a woman, her garments covered with the most delicate frost work lace, fringes and tassels, more delicate than the finest silk, and that a breath of wind would disturb and break; a gossamer-like bridal veil of frost hung over all, looped and gathered into folds. It was the most delicate frost work I have yet seen. With one beam of sunlight all would have disappeared. The whole fabric was so fine that parts were continually breaking off and falling on the snow below, making a train for the dress. . . . I had now been in the Basin several hours, had seen boiling water and solid ice within less than a foot of each other, and little mounds of green and blue tinted ice, where the spray from the small geyser jets fell; and I had stepped across running streams of hot water, with my snowshoes elevated above the stream by two or three feet of snow and ice. In summer no such extremes meet; nothing so beautiful and delicate as the frostwork is then to be seen. Before I left the Basin the fog lifted; the wind began to blow, swaying the trees about, rattling their icy garments; the ghosts and goblins were going through a weird dance, bowing and swaying to each other, accompanied by the mournful music of the wind as it sighed and moaned through the pines. . . . The clouds lifting showed Mt. Holmes in the northwest. This beautiful peak with its snow-capped summit rose from the dark masses of green timber. In places the trees were so laden with snow as to give the whole forest a white appearance; the last snow had covered every limb and bough, and one could call it a forest of silver trees. In a few places the wind had blown the snow off, revealing a dark green and giving to the landscape the appearance of shadows of passing clouds. Call the concessionaire Xanterra at 307-344-7311 for room and snowcoach reservations—or contact one of the private concessionaires, if you’d rather drive a snowmobile. And keep your fingers crossed for snow! See my report on a winter trip to the park. You could ski in Yellowstone Park this winter! Comments Off on You could ski in Yellowstone Park this winter! As the leaves begin to turn and we begin to think ahead to the holidays, it’s also time to plan that Yellowstone winter trip you’ve been hoping to take. Having been lucky enough to visit four times in the winter, I can tell you there is nothing like it in the world! To whet your appetite, here’s a paragraph from a historic winter wonderland story that dates back to the bitterly cold February of 1887, when there was no hotel at Old Faithful. The story tells of Yellowstone Park guide and intrepid skier Billy Hofer’s experiences in the Old Faithful area as he skied around the park on a wildlife-counting tour for Forest and Stream magazine. What Hofer calls “shoes” are the 9-foot-long skis he made for himself. Until the park reopens fully next April, we won’t be able to follow any of its wonderful trails except for those open to skiing and snowshoeing. But I have happy memories—as well as anticipation for my own future use—of walking wonderful Yellowstone trails in the summer season. Yellowstone Treasures’ first edition (2002) listed 59 trails that I recommend, having walked all of them myself, most of them several times. But now in the fourth edition we’re down to 56, and here’s my chance to explain what happened to those three lost trails! First, in the Canyon area, the trail from Artists’ Point east along the canyon’s south rim, where I’ve written (on page 182 in the new edition) that you can see “some of the most awe-inspiring sunset colors you will see anywhere, with the sky and canyon rivaling each other on a beautiful evening.” This trail is not maintained for casual walkers. The National Park Service warns hikers of uneven footing and steep drop-offs; it’s also narrow and sometimes slippery. 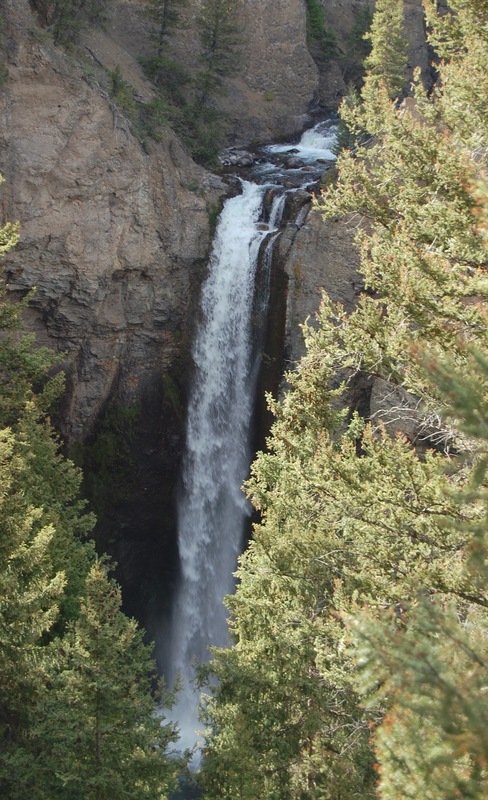 Next, the trail to the base of Tower Fall has proven so difficult to maintain over the years that it disappeared from my table of walks (pages 366 to 368) as early as the second edition of Yellowstone Treasures, which came out in 2005. The picture below shows Tower Fall from the easily accessible viewing platform. Most recently, I’ve had to remove a quiet, little-used, level road with many wildflowers and lovely mountain views that was formerly open to biking and walking, This was a two mile (in and out) route leaving the main road south of Swan Lake in the northwestern part of the park. It has been closed for public use for a year or two now and is only a service road. For your information: The park will not reopen until December 15; from then on until early March there will be relatively limited access. Only snow coaches and snowmobiles may use the groomed roads. The one road that is plowed for cars and trucks goes from the North Entrance at Gardiner to the Northeast Entrance and on to Cooke City. Of course, winter is the best time to see wolves along that road, especially in the Lamar Valley. Things are off to a slow start this year , with snow cover just sufficient to open the roads to over-snow vehicles on December 15. As of Dec. 27, Old Faithful and the West Entrance had 15 inches of snow on the ground, the East Entrance had 14, and Mammoth only 3. The new official (but temporary) plan allows 318 snowmobiles and 78 snowcoaches to enter Yellowstone per day. Just outside the East Entrance, one of the oldest downhill ski centers in the U.S., dating from the 1930s, has re-opened after having been closed since 2004. There’s where you can catch the lift at the Sleeping Giant Ski Area, or you might go across the road to use the cross-country trails at Buffalo Bill’s summer home, Pahaska Tepee. Inside the park, visitors can now cross Sylvan Pass. As of December 22, after rangers used howitzers to help prevent avalanches from blocking the 8500-foot (2600 m) pass, it was opened to over-snow vehicles and ambitious skiers. Winter use of this entrance has created controversy for years due to the high cost of keeping it open for relatively few visitors.